In honor of the holidays, we’re going to talk about everyone’s favorite topic: rodents. Winter is the time of year when rodents tend to invade in groups, seeking shelter from the cold. As a homeowner, you need to protect yourself, not only by sealing up potential entranceways but also monitoring your home for signs of a rodent invasion. The following are warning signs of a rodent infestation. Droppings – When rodents invade, they leave droppings. Both mouse and rat droppings are small brown pellets, and they tend to be found in hidden in cubbies, inside of boxes, in cabinets, and so on – anywhere rodents can hide and travel. Examine for signs of these droppings, as they are a clear signal that mice have already been inside of your home. 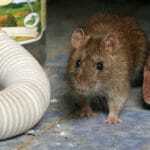 Scurrying and Sounds – You should also be listening for sounds of rodent invasions. Mice tend to squeak and scurry. When everything is silent, listen for noises. If you hear squeaking, scratching, and scurrying noises, chances are there is some type of rodent inside of your home. Smells and Dead Rodents – Rodents also have a tendency to die. Most rodents do not survive very long, even with abundant food. That is why a bad smell or the presence of a dead rodent often mean there are some out there that are still alive and well. Gnawing – Many rodents gnaw on furniture and wood. If you see unexplained gnawing anywhere around your home, especially furniture, you have to be careful about the potential for a mouse invasion. Dirt Marks – Rodents also get very dirty and show a great deal of disregard for your property. So keep an eye out for streaks of mud and dirt in unusual places in your home. That may be the trails of filth left by these rodents. Rodents carry disease, damage property, and lead to the purchasing of brooms for shooing and screaming. They are not necessarily something you should leave to chance. Call Green Pest Solutions and get a professional examination, so that you can find out if you have an infestation and what to do about it.